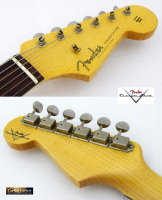 Over the past decade, we have sold more Fender Custom Shop Stratocasters than any other electric guitar model. 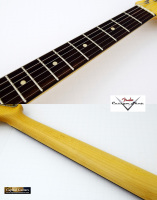 Despite a design that is more the 60 years old, the Fender Stratocaster remains one of the most flexible, playable and toneful models being made anywhere and Stratocasters from the Custom Shop are the best that Fender makes. 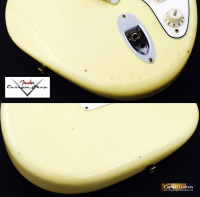 Offered here is a '60 Strat Relic made in the Fender Custom Shop in 2017. 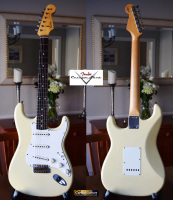 This Vintage White Relic Strat has a two piece Alder body with a nitrocellulose lacquer finish and Fender's "Journeyman" level aging. It has a quartersawn Maple neck with a 60's oval C shape and depth measurements of .80" at the first fret and .940" at the twelfth fret. 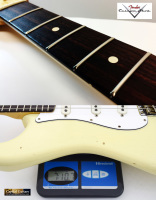 It has a dark AAA grade Indian Rosewood fretboard with a 9.50" radius, medium/jumbo (6130) fret wire and a 1.650" bone nut. 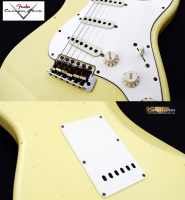 The electronics include three Custom Shop handwound "dual mag" pickups as designed by Mike Eldred, along with a traditional Strat wiring setup, master volume, two tone controls and a five-way switch. It weighs just under 7 pounds, 11 ounces. 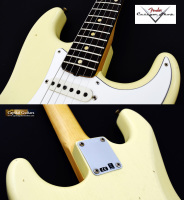 Fender Custom Shop Strats are consistently excellent instruments and this team-built beauty is no different. It looks, plays and sounds like Strat should and the tone is quacky and clear. Please check out the brief sound sample provded - this guitar sounds like the iconic instrument that it is! This guitar hasn't seen much play, as the frets are spotless as evidenced by the included photo. It comes in it's mint original G&G case along with the Certificate of Authenticity and all of the accessories shown. New this guitar will cost you $3,600. Get this beauty for a cool grand less. This is a great, workhorse Strat. Make it yours!